Why build your own Easter basket when we make it so easy? 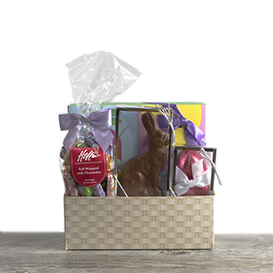 Filled with over a pound of chocolate Easter treats, our Small Easter Basket Box is sure to make everybunny happy! 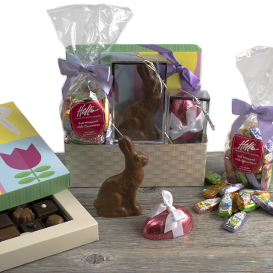 A One Layer Deluxe Collection box featuring 16 pieces of our best-selling chocolate, finished with a bright and colorful Easter topper. A half-pound bag of creamy Milk Chocolates, individually wrapped in colorful Easter Bunny foil. A solid, four ounce Swiss Milk Chocolate Easter Bunny. A Swiss Milk Chocolate Caramel Nut Egg, filled with buttery, golden caramel and fresh-roasted cashews.